Kim Etheridge and Wendi Levy are the duo behind Mixed Chicks decided to create a product line because they needed it. Curls when younger seemed so much easier to control, maybe because it wasn't us doing it, or experimenting further more. I have had such a love - hate relationship with my curls. More the latter. It never had a defined curl pattern - which annoyed me. My hair behaved however it felt to on whatever day it was. When my hair was washed and conditioned, most times it would be left to air dry, very rarely was it blow dried and when it was, hello Ms Diana Ross, ok so it was more like a scarecrow but the only thing that was used in my hair was Babylove hair lotion. From about 18 months until I was 12 that's all I used in my hair. Once it was dried and moisturised, it went into a ponytail - that's it. My curl pattern after wash day, well it depended my hair would either be wavy, but my waves started from the tip of my ear so from the root to the ear tip, it was straight with some waves around the hairline and then the rest would be wavy - confused much. Then as the days went on my hair got more curly from the root and the curl pattern would change. I would moisturise my hair daily due to it getting frizzy by the time I got back from school. I had my little halo happening! Then of course my love for straighteners happened and here I am now. Crying for curls, since getting my hair cut in November I've had some more bounce in my hair but of course it's getting my hair memory back so curl products overload, as being a curly girl it is another thing to add to the list and finding a hair regime that works isn't something that happens in a day or even a month. I've read a lot US side regarding Mixed Chicks but it wasn't largely available in the UK so when the opportunity came to try it out, I decided to do so. There's a good and bad ways with trial packs, you may need more than one if your hair is longer, it's not enough time to know if a product works, you won't waste money if it doesn't work for your hair. 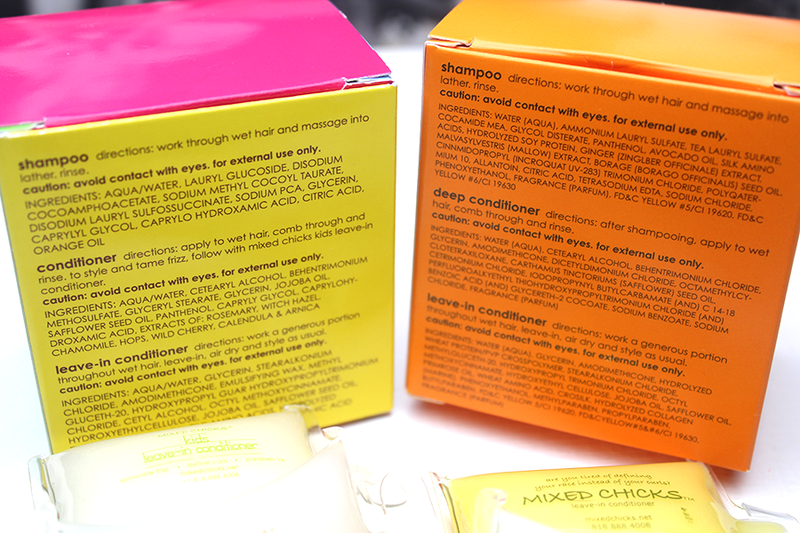 In each packet you get a shampoo, conditioner and leave in conditioner. Of course not being a lover of shampoo I gave it a go, the trial shampoo has Ammonium Laureth Sulfate. Ammonium Laureth Sulfate is the ammonium salt of sulfated ethoxylated lauryl alcohol. It can be derived from coconut. Ammonium Laureth Sulfate is an effective cleansing agent that remove oils and dirt from hair and skin. It produces a lot of foam and softens the skin. It also helps to prevent an emulsion from separating into its oil and liquid components. Ammonium Laureth Sulfate can cause eye and skin irritation. While the kids shampoo has Lauryl Glucoside in, which is seemingly becoming a favourite cleansing agent in products. I didn't bother to part my hair I just squeezed parts little by little and started with my scalp and lathered up that way and bought the lather downwards and added any more as I needed it. I preferred the ingredients in the kids conditioner with the addition of Jojoba oil which is an oil close to the scalps own sebum, giving a nice shine to the hair. The leave-in conditioner had Jojoba oil in both of them but out of the two products, the addition of the leave in conditioner didn't agree with my hair much. It dried crispy even with the addition of my normal hair products and I found this odd as my normal hair products is coconut oil. Strange right! My hair did dry with a nice curl pattern but it didn't feel or look nice, I had no choice but to re-wash my hair. I'm still interested in trying the range, fuller bottles I would invest in and probably re-try another leave in conditioner but it may be a slight waste as I normally don't use a leave in conditioner. Mixed Chicks official website has a list of UK retailers online and in stores. Curly girls love Mixed Chicks?